Future World is comprised of eight pavilions (or nine if you count the East and West wings of Innoventions separately). Spaceship Earth is the most prominent and is the attraction that usually comes to many guests’ minds first when thinking of Epcot. 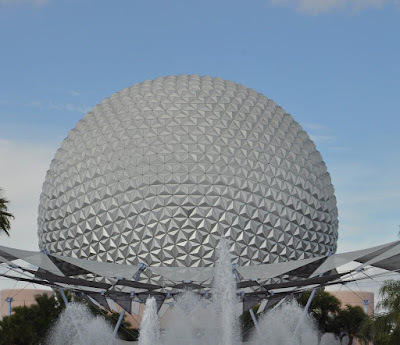 It’s that big golf ball-looking attraction right at the front of the park where you learn about how communication has changed since we were cavepeople. Just past Spaceship Earth is Innoventions. Innoventions is actually two buildings-East and West-each housing several different exhibits, most about technology although some exhibits are to help teach kids about safety and saving money while others are just plain fun--like The Sum of All Thrills where you can design and ride your own rollercoaster or Segway Central where you can take a short lesson on how to ride a Segway. At the end of Innoventions West is Club Cool--the only place in Epcot where you can have free, all-you-can-drink soda. It is actually done by Coca-Cola and features the different sodas they have in countries around the world (give them all a try...my favorite is the Krest Ginger Ale; and I’ll give you fair warning about Beverly...but try it anyway!). -Universe of Energy-Ellen’s Energy Adventure--all about...yes, you guessed it-energy! Where it comes from, different types, new energy sources. And you get to see dinosaurs...but I won’t spoil the ride for you. This is a great ride for when you want to take a break from the walking and the heat as it is about 30 minutes long and you get to sit down for most of it. -Mission:Space-this is a motion simulator thrill ride that lets you feel what blasting off into space would feel like--crushing g-forces and all. PLEASE NOTE-you must must must be in good health to ride this and if you are in any way claustrophobic at all--do not get on this ride. Seriously-once you get in, the entire front of the compartment closes and is about a foot to eighteen inches from your face. It is basically a huge human centrifuge and lets you experience up to 2.5G’s of force on your body...and let me tell you, you REALLY feel it. They have had people who have issues with motion sickness so they even include “barf bags” inside for your convenience (though I’ve never seen anyone need one when I’ve ridden). About 3 years after it opened, they opened up a less intense version (the green side; the full ride is the orange side). It is amazing how they were able to create this ride and I do love it, though even I don’t ride more than once per trip (and I’m a HUGE thrill ride junkie, the more crazy the better). -Test Track-one of my all-time favorite Disney rides-you get to ride a “test” vehicle through the different procedures vehicles are put through before they are deemed to be safe for people to drive. For the first part you trundle over bumpy roads, go through extreme simulated weather conditions, brake testing and hill testing/curves. The second part is outside (and it’s pretty cool how you get out there) where you do a high speed trial on curves and straightaways, eventually going just shy of 65 miles per hour (the big display shows 64.8)--the fastest Disney ride. Make sure you hold on to anything you want to keep as your vehicle is open to the air! -Imagination-this was originally The Journey Into Imagination until 1999 when it was renamed. It is basically a look at how your imagination can make you see things differently. It is made up of a ride portion, then an interactive area. Personally, I wish they would bring back the original setup with the original Dreamfinder animatronic character and the fun ImageWorks interactive area. The ride now is okay...a good way to get off your feet and be in the air conditioning for a bit...but it doesn’t really draw me to it anymore. They did bring back the 3-D Captain EO short film (starring the late pop star Michael Jackson) so if you didn’t get to see it the first time around, now’s your chance. -The Seas with Nemo and Friends-another pavilion that started off differently...this was originally The Living Seas and had a movie, ride and then the aquarium area. I miss that version-I really liked that movie and ride. Now the pavilion is themed with Nemo and Friends, I’m guessing to make it more interesting to children. So now you walk through a nicely beach-themed queue area to board your “clamobile” to ride through an undersea-themed area looking for Nemo. Eventually you find him at the big aquarium. Once you get to the aquarium area, the cool part begins--and by that I mean the 5.7 million gallon saltwater tank with tons of fish, sharks, turtles...and even dolphins! They have educational talks about the fish and dolphins and sometimes you’ll even get to see the divers in the tank. There’s also a manatee area with some rescued manatees (definitely stop by and see them) and smaller tank areas with tropical fish and other undersea creatures. Also the popular Turtle Talk with Crush where he actually interacts with the kids, answering questions. There is also the Coral Reef Restaurant here (you can dine right there next to the huge aquarium-romantic and great atmosphere (pretty darn good food as well). -The Land-this pavilion is about what else-the land...and the way we interact with it and how we can preserve it. The attraction Soarin’ is here where you can experience the feel of hang gliding over different areas of California (the ride is a copy of “Soarin Over California from Disney’s California Adventure park) and is viewed on a huge IMAX screen. *TIP*-lines for Soarin’ grow very quickly and stay long throughout the entire day. If you want to experience this ride, either 1) go there the moment the park opens, do not deviate to anywhere else first; 2) go there and get a FASTPASS and ride when your window opens with little to no line; or 3) go right before The Land closes. Or all three. Also in The Land is the Circle of Life: An Environmental Fable film starring The Lion King characters about how actions can harm nature. My favorite ride in The Land, though, is Living with the Land-a slow boat ride through the pavilion focusing on agriculture and includes riding through the greenhouses--which have really cool stuff! You get to see different ways of growing plants and food and new, experimental ways as well. Where else are you going to find nine-pound lemons? The other cool part of The Land is the opportunity to take the Behind the Seeds Tour. You actually get to walk through the greenhouses with a guide who tells you all about what goes on there. It really is a great tour and actually not too expensive compared to some of the tours at the resort (currently $18 for adults, $14 for kids 3-9 yrs old...if you are a passholder you can get a discount). I’ve done the tour several times and would recommend it (I actually did it way back when it was only $5 per person...ah, those were the days!). Norway-is designed to look like a traditional Norwegian village including a very detailed Stave church. There is a boat ride here as well, Maelstrom which is pretty cool. After the boat ride there is a short film which my husband and I actually like a lot (we might be weird though, some people just find it boring though I just don’t get that). There is a table-service restaurant that offers character dining (Princess alert!) and a bakery (try the schoolbread, yum!) as well as some shops (love the trolls). China-has a Circle-Vision 360 degree movie (warning-you stand throughout the movie), shops (some really great merchandise here, love the jewelry and teapots), a table service restaurant and a quick service restaurant (yummy apple cinnamon egg rolls at the quick service, good snack). You may also want to try the Joy of Tea stand that’s near the water outside of the main area of the pavilion...I hear there’s a good combo meal there. Germany-designed to look like a small German village (cool!) and is home to The Biergarten buffet restaurant with live entertainment as well as a quick service restaurant...it also has several shops including the diet-crushing Karamell-Kuche shop (but oh my everything there is SO YUMMY! Try the chocolate cookies filled with caramel-you can walk it off during the rest of your trip). As you are leaving Germany, be sure to look to your right for the miniature trains and village. The detail is amazing and they change it depending on time of year (at Christmas it even has Christmas decorations). Something everyone in the family will really like. Italy-has shops with Italian merchandise and two restaurants. Via Napoli is one of my favorite restaurants here...the personal pizzas are big enough for two people (if a bit pricier than you’d expect for a “personal” pizza) and really yummy. But you can also find one of Disney’s great food values in Via Napoli’s walk-up window outside the restaurant. It serves Sicilian-style pizza slices that are HUGE and don’t cost much at all for the amount of food you get. My husband and I had lunch at the window for about $10-$12 total for the two of us and we were stuffed! The American Adventure-of course we had to have America represented...and it is the host pavilion of the World Showcase. The attraction inside is an audio-animatronic show and film about America’s history, It’s actually pretty good...plus, another chance to sit for a while in the air conditioning. The Voices of Liberty, an a capella group performs inside the building’s rotunda several times during the day (they are really good, be sure to stop and listen!). The America Gardens Theater sits across from the main building next to the lagoon and hosts many different entertainment acts during the year, including the musical groups scheduled to perform during the Flower & Garden Festival and Food & Wine Festival. There’s a restaurant and gift shops...and be sure to stop by the funnel cake stand before going, yum yum yum! Japan-has the Misukoshi department store with lots of really cool things including the pick-a-pearl section (you get to pick the oyster and they’ll open it and see what pearl you got inside...for a price of course...somewhere around $20 I think). There is a museum area/art area that has different exhibits which is worth a look. There are three restaurants, one is a quick service and the other two are table service-one a sushi place and the other the traditional teppanyaki dining (or as my godson says, “I want to eat at the place where the man cooks in front of you”). This is also the home of the Taiko drummers (they are really good, make sure to stop and listen). Morocco-composed mostly of bazaar-style shopping and restaurants. Morocco is actually the only pavilion where the country helped with the design. The King of Morocco actually sent artisans to Disney World to assist with design and creation, and the government also sponsors the pavilion (the other countries’ pavilions are sponsored by corporations). The shops have some very nice merchandise here. Also be sure to check out Mo’Rockin-the belly dancer is amazing! France-here you’ll find a miniature Eiffel Tower (well, miniature compared to the real thing that is), shops (be prepared for the strong smells in the perfume shop! ), two restaurants and a pastry shop (OMG everything in there is delicious!). There is also a film called “Impressions de France” which is really very good, has fantastic music by famous classic French composers and again allows you eighteen minutes off of your feet in the air conditioning. United Kingdom-is designed to look like a typical British village and also has British gardens including a hedge maze. There are several shops here including a tea shop, a table service restaurant in the form of The Rose & Crown Pub and Dining Room, and a quick service fish-and-chips window. Oh, and check out the traditional red phone booths. And if the phone rings, be sure you answer it! Really! Canada-the landscaping here is fantastic-the gardens are beautifully laid out and there’s a pathway through them. The O Canada! movie plays here, a Circle Vision 360 film about Canada. The Celtic rock band Off Kilter plays here pretty regularly. The Canada pavilion is also home to Le Cellier Steakhouse. Le Cellier is now a Signature Dining location; it is quite expensive but very, very good. Le Cellier books up very fast...if you want to eat here it is strongly recommended you book your reservation the moment your booking window opens. The chances of you walking up and getting a table without a reservation are slim to none...leaning very heavily to none (yes, it is that good!). So, those are all the pavilions and attractions at Epcot. There is also a nighttime show in the World Showcase lagoon each night when the park closes (normally around 9pm) called IllumiNations: Reflections of Earth. It has fireworks, lasers, water fountains, music and a huge rotating globe with LED screens in the middle of the lagoon. The show tells the story of Earth. The show is extremely popular with guests lining the World Showcase lagoon up to two hours before the show starts to get an up-front seat. You can see the show well from pretty much anywhere around the lagoon. Whew! Lots of things to see and do here in Epcot. I would definitely recommend two days to be able to completely cover the entire park, especially if you have young children with you. Speaking of young children-if you’re worried they’ll be bored with the countries, don’t worry-each country has a “Kidcot” station with activities for the kids. Epcot is our (me and my husband) favorite park. It’s always interesting, even if you’re only walking around taking in the atmosphere. Be sure to check out the details in the countries. Disney is known for its authenticity in its attractions and that is abundantly apparent in the World Showcase. Also make sure you check the Times Guide to see what live entertainment is going on-there’s lots of it, especially in the World Showcase (I love the comedy juggler show in France).